Are you ready for a MomsTown makeover? Tired of the stereotype of the stay-at-home mom as someone who cooks, cleans, and carpools? Ready to be part of a new generation of SAHMs (stay-at-home moms) who are full of dreams, goals, and vision? If so, welcome to MomsTown! To have fun along the way! In this simple program that even the most overscheduled mom can follow, you'll also learn the virtues of vanity, the power of full pockets, how to master the quarter hour, the importance of finding a partner in crime, and how to get over your Big Buts ("but I don't have time . . . but I don't have the energy . . . but I don't feel motivated . . ."). 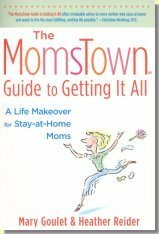 A practical guide to reshaping your attitudes and reigniting your passions, The MomsTown Guide to Getting It All will help you create your most fulfilling life as both a woman and a mom.